I've got a new crush. One of the books for this season's module is "I and Thou" by Martin Buber. I think if I really understood the book I wouldn't have anything at all to say about it. But I don't understand it all so I'll go on for a paragraph or two. Buber, a Jewish philosopher, (which is sort of like saying, Jesus, a Jewish carpenter's son) warms my little philosophical heart. I know I'm reading a translation but Buber still manages, even through time, culture and a different language, to give me a fresh vocabulary for both my thoughts and my experiences. There's a lot of Buber, I realize now, in Peter Rollins' book from the last module, "How Not To Speak of God". And having now read Buber, I prefer Buber. I'm pretty sure Pete Rollins would say the same thing. Tonight, as I'm typing this, I can't even begin to put into words what this little book has done for me. I've been prepping my talk for tomorrow and in one half of one paragraph, Buber manages to describe exactly what I was trying to get at about parables without mentioning parables at all. He writes about ground being so ready for this new thing that with a single touch, it erupts with life. I'm erupting all over this book. Buber passed away in 1965 after living many years of a very productive life in Jerusalem. It's good that he won't be there when I visit in a few weeks. It will save me the embarrassment of tracking down his address and pacing outside his house, pretending to be "walking by", hoping to bump in to him on his way to the market. This is how I've handled previous crushes - just ask the Elusive Donna - but this time I will have to content myself with my experience of this brilliant mind through the legacy of ideas he has left behind. 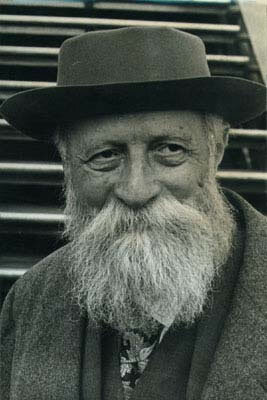 I've got a lot to learn but this I know, Martin Buber knew how to rock a beard!